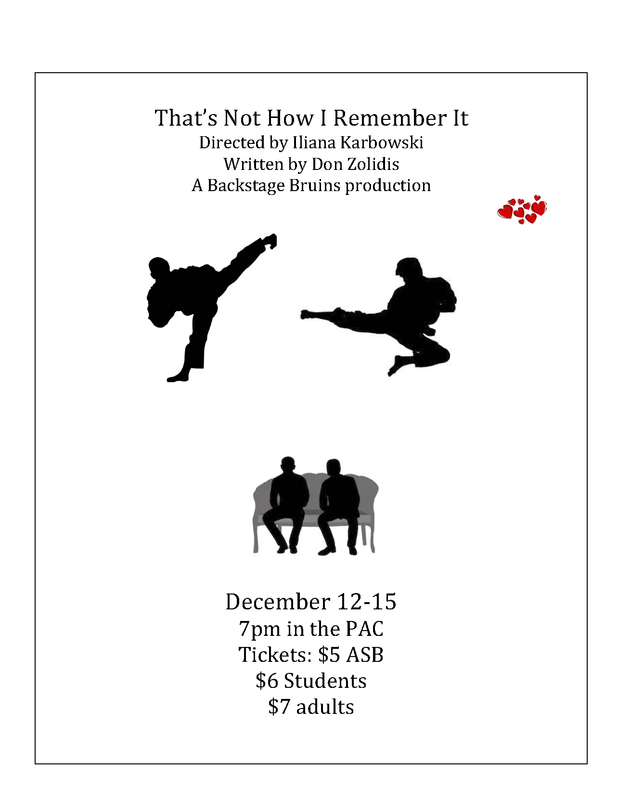 The Backstage Bruins proudly present the faculty show: “That’s Not How I Remember It.” Watch the promo here. Come see some of your favorite teachers in this radical 80’s comedy. Mom and Dad love to tell the story of how they met in 1986 -- "pretty much the most awesome year ever." Trouble is, they remember their courtship completely differently. Mom's version makes their meeting sound like a sappy romantic comedy, while Dad somehow makes himself the star of a karate battle. This tubular one-act is a crazy homage to bad 80s movies and the inadequacies of memory. Student Tickets are $6.00 or $5.00 with ASB, and $7.00 for adults. The show starts at 7pm in the PAC on December 12th, 13th, and 14th. Doors open at 6:30pm.